Stations 4, 7, 18 and 26 responded to a fire in a single family dwelling located at 1331 Beavers Pass Road near Smoaks at 2211, Sunday evening 29-May. Engine 7 found heavy fire conditions on arrival with flames coming from the front of the structure, threatening the homes within 15 feet on each side of the building. Click here for additional information. Congratulations to Firefighter/Paramedic Robert Gregory and his wife Amy on the birth of their second son, Garret Allen, born at 14:32, weighing 8 lbs. 4 oz. and 20 1/2 inches long. Both baby and mother are doing great. 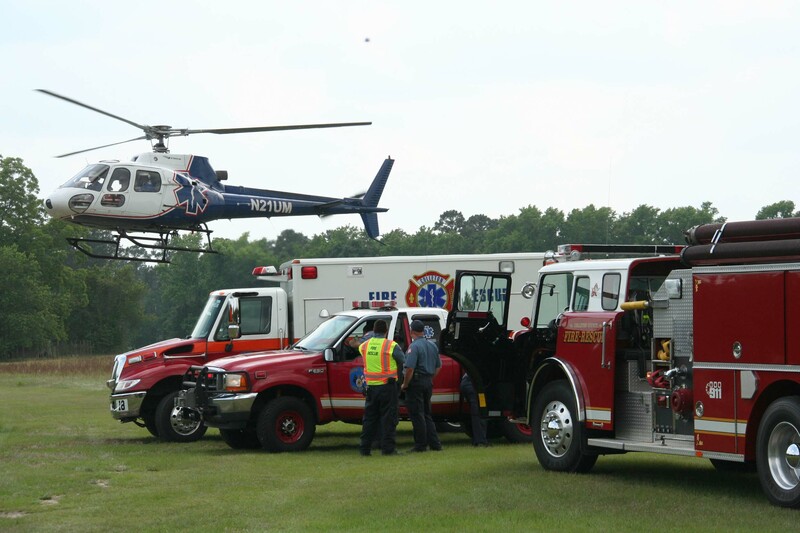 The Ruffin Baptist Church, located at 191 Double Churches Road in Ruffin, has invited all Fire-Rescue personnel to attend the church’s sixth annual Memorial Day Tribute honoring all Military and Public Safety Personnel. The event will be held on 30-May, with worship service at 1100 and a Thank You Dinner held immediately following the service. A 25 year old Canadys woman received leg wounds in a shooting incident that occurred at 10347 Jefferies Highway, Tuesday evening 25-May at 1944. 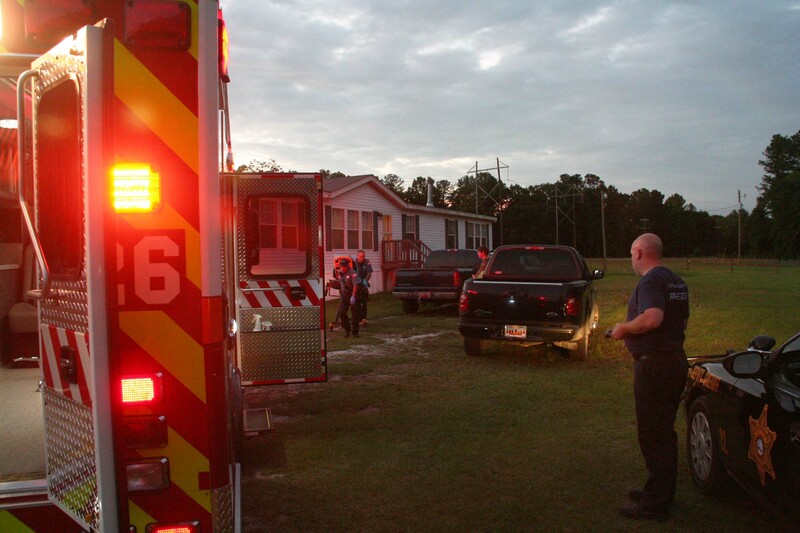 Sheriff’s Deputies and Fire-Rescue responded to the residence on a report of a woman being shot at the location. Deputies searched the scene and could not locate any persons in or around the residence. Click here for additional information. 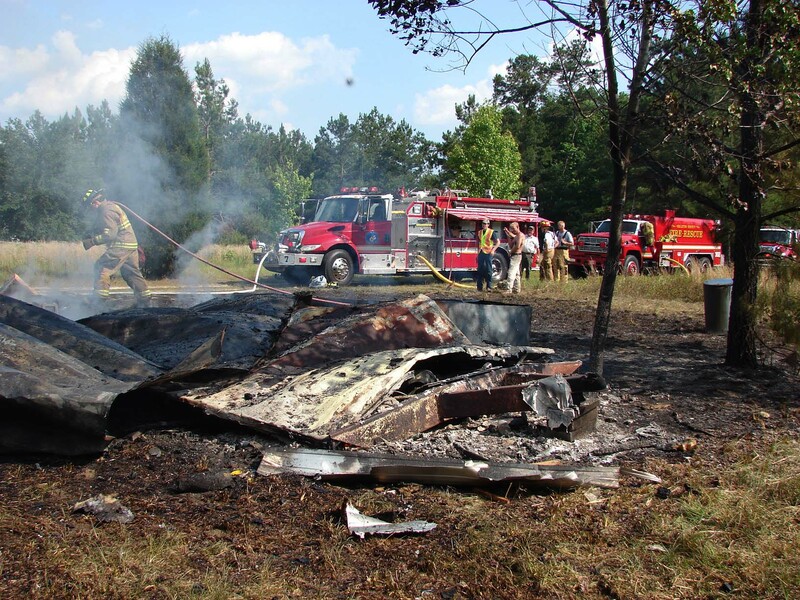 Stations 3, 7, 23 and 18 responded to a 20 ft camper/RV fire near 86 Tiffany Lane west of Smoaks Sunday afternoon 23-May at 1552. The incident was originally called in as a grass fire that had gotten away from the land owner. The call was cancelled a short time later advising they had gotten it under control. Click here for additional information. Stations 1, 2 and 6 responded to a single car MVC on ACE Basin Parkway north of Balchem Lane at 1448 Saturday afternoon 22-May. 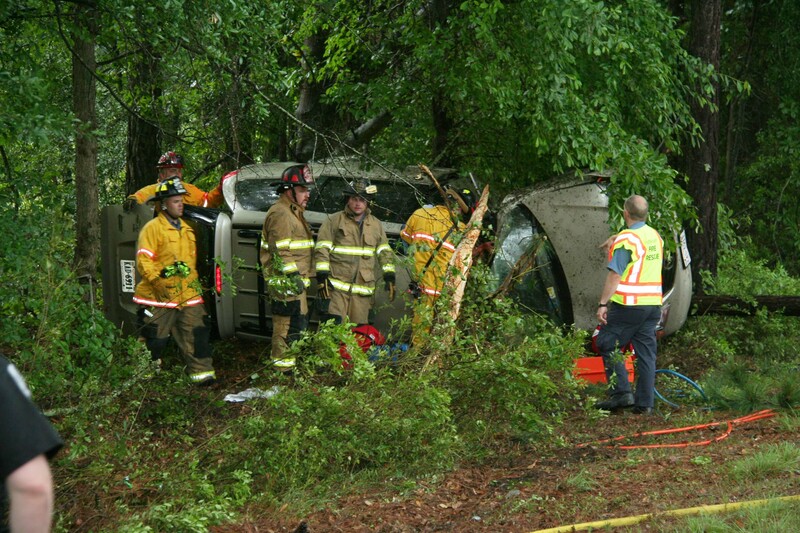 A northbound Volvo station wagon left the roadway in heavy rains, struck several trees and overturned. It was initially reported that the driver was trapped in the wreckage. Click here for additional information. Stations 1, 18 and 23 responded to a moderate speed MVC on Confederate Highway west of Halyard Road at 1351, Friday afternoon 21-May. The westbound Ford Crown Victoria left the roadway at approximately 50 mph, striking several trees and causing heavy to the driver’s side of the car. Both occupants were wearing seatbelts and the air bags deployed. Click here for more information. Stations 1, 19, 26 and 27 responded to a structure fire at 34 Jared Street Thursday morning 20-May at 0817. Engine 1 arrived to find light smoke coming from several windows in the singlewide mobile home. Upon inspection, firefighters found the fire was confined to a small bedroom at the “D” side of the structure. Apparently an electrical short in a wall outlet caused the fire which spread from the outlet to an adjacent bed. Click here for additional information. 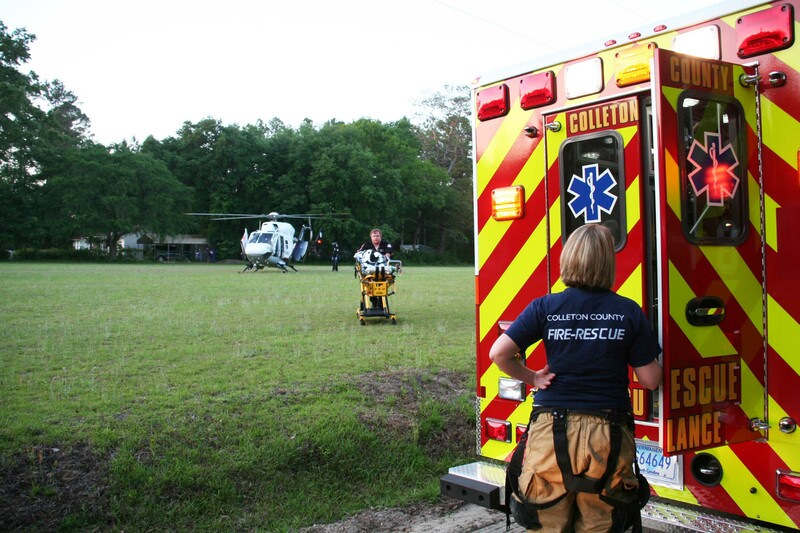 Colleton Medical Center honored Fire-Rescue and the private ambulance services during national EMS Week. 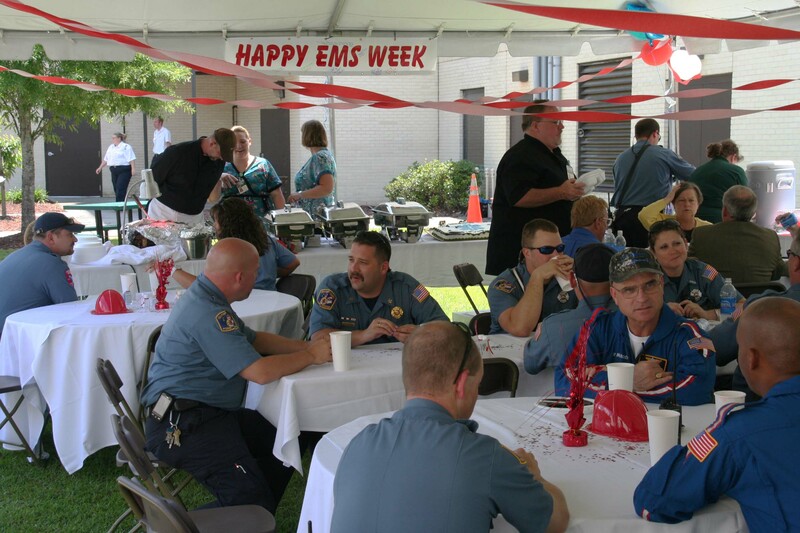 The hospital set up a tent behind their facility on Robertson Blvd Wednesday to serve lunch to the personnel. The dinner was to recognize the pre-hospital providers and ambulance service personnel in the County. Click here for additional information. 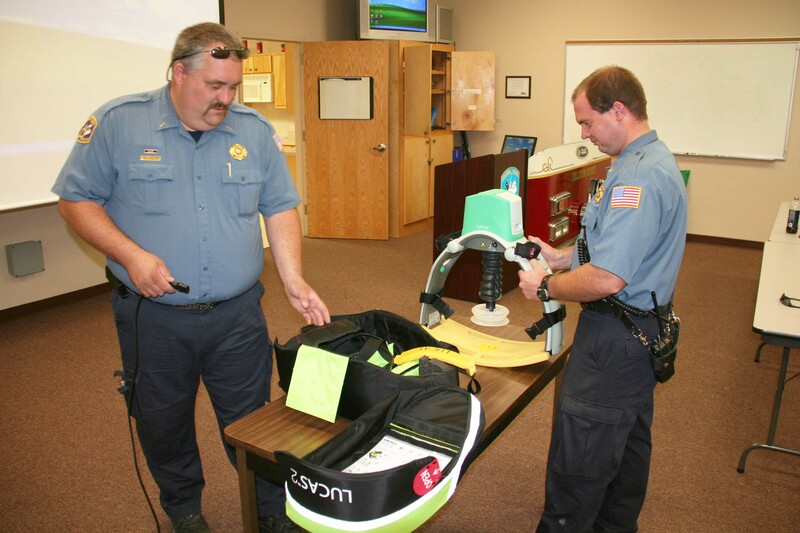 Fire-Rescue has received six automatic CPR devices to be used on the ambulances. The unit, which is battery operated, eliminates the need for a person to perform the chest compressions during CPR. The devices are called Lucas and manufactured by Jolife of Sweden. They are distributed in the US by Medtronic Corporation. Click here for additional information. Stations 26 and 27 responded to a two car MVC at the intersection of Jefferies Highway and Robertson Blvd Tuesday afternoon 18-May at 1620. The two cars collided in the intersection resulting in a Chevrolet S-10 Blazer over-turning, blocking the northbound lanes. The occupants of the Blazer complained of non-life threatening trauma injuries... click here for additional information. Stations 1 and 27 responded to a high speed single car MVC on I-95 at the 49 mile marker northbound at 1253 Monday 17-May. 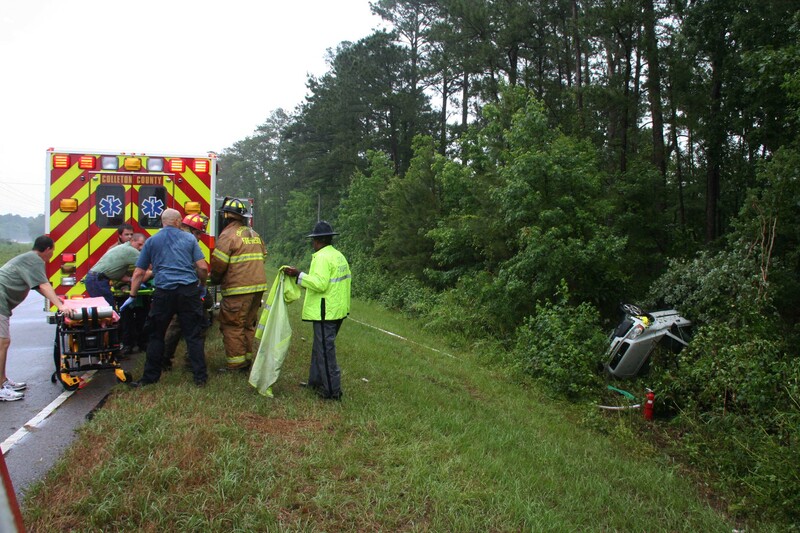 The small mini-van left the roadway in blinding rain before striking several pine trees. The vehicle suffered heavy damage when the driver’s door took the brunt of the impact, then rolled onto the passenger side. Click here for additional information. 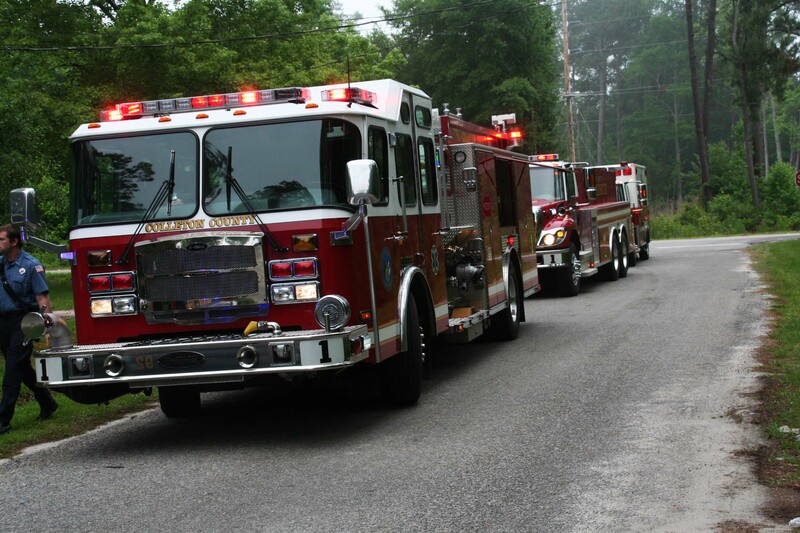 Stations 1, 12, 19, 24 and 27 responded to a house fire at 214 Hickory Street in the Hampton Drive Subdivision at 0124, Sunday morning 16-May. A neighbor at 212 Hickory Street told 9-1-1 operators that he was awakened by a loud popping sound. When he investigated he saw flames coming from the house next door. Click here for additional information. 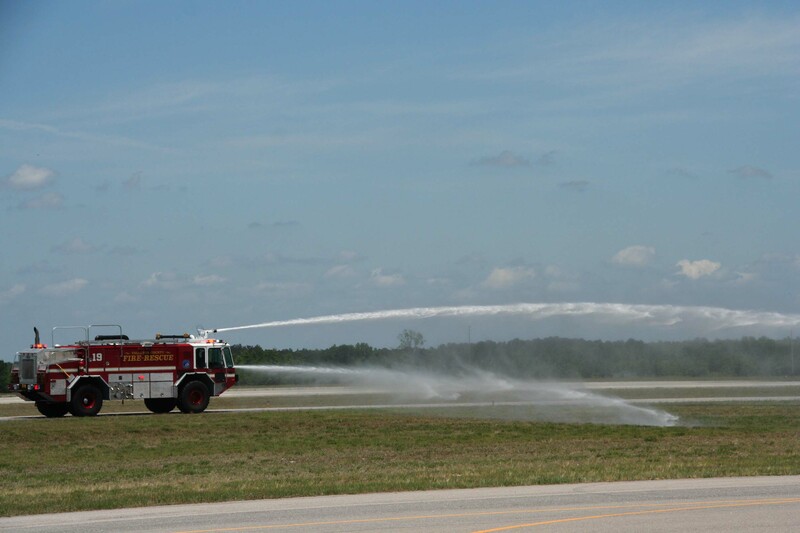 Fire-Rescue participated in the airport’s “Wings and Wheels” event held Saturday at the Lowcountry Regional Airport on Aviation Way 15-May. The event showcased vintage and present day aircraft and automobiles. The large crowd was able to view early day biplanes as well as one of the military’s newest helicopters. Click here for additional information. Fire-Rescue had the honor to participate in the dedication ceremony for the local Law Enforcement Officers Memorial which has been placed on the Courthouse grounds at 101 Hampton Street. Ladder 6 and Ladder 19 were positioned to hold the US Flag over Hampton Street. The beautiful black monument was erected Thursday and protected with a black veil until Saturday morning. Click here for additional information. Colleton County Firefighters participated in the annual Relay for Life event at the High School Track Friday evening 14-May. Firefighter-EMT-I Roger Johnston coordinated Fire-Rescue’s participation which included multiple personnel. Fire-Rescue operated the concession stand for the participants, prepared food and operated the dunking booth.Click here for additional information. Engine 26 and Medic 26 responded to a medical response with Sheriff’s Deputies at 45 Ann Court to assist with a woman suffering from a behavioral disorder. On arrival, deputies were having a confrontation with the woman who was tazed several times in attempts to get her under control. 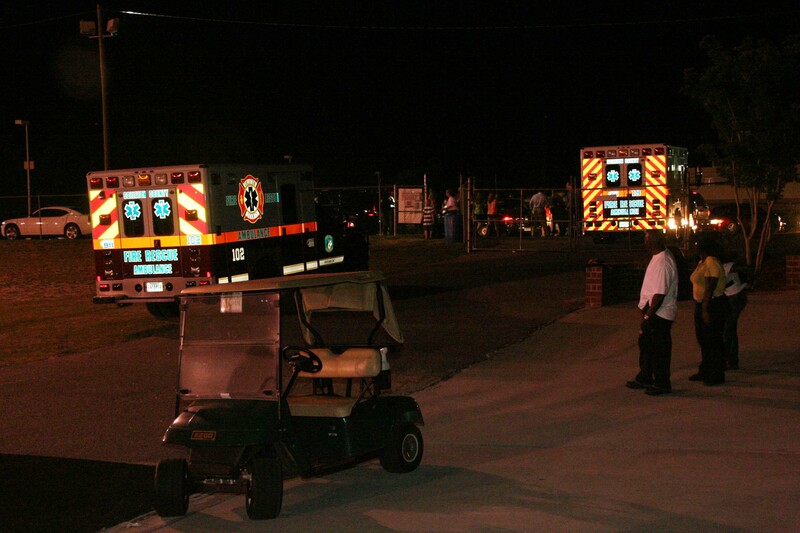 She was later transported by Medic 26 to Colleton Medical Center. Click here for more info. We would like to congratulate Firefighters Randy and Patricia White on the birth of their son Robert Lee who born on 14-April. Robert weighed 6 pounds, 14 ounces and was 19-1/2 inches long. Keith Rucker, full time Region 6 coordinator for the South Carolina Fire Academy, went into cardiac arrest yesterday at the fire academy in Columbia. The SCFA first responder team rendered care which required the use of the AED and revived him. Keith was transported to Richland Memorial and is in the ICU in very critical condition. Please keep Keith and his family in your thoughts and prayers. 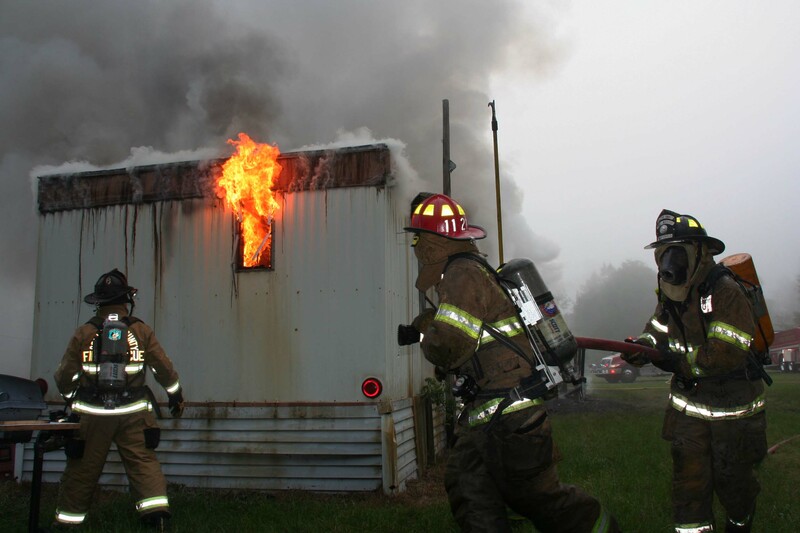 The Lower State Firefighters Association will have its quarterly meeting on 24-May at 1900 in Hampton, SC. The meeting will be held at the Hampton Fire Department (Second Street West) in the Town of Hampton and is being hosted by the Allendale County Fire Departments. The program will be provided by North Greenville Fitness. They will be speaking about standards for physicals in the fire service, reading your physical results, and recommendations for results and exercise. Please email Chief Kenny Harrison at jharrison@scana.com or call him at (803) 942-1364 by May 17th if you plan on attending. 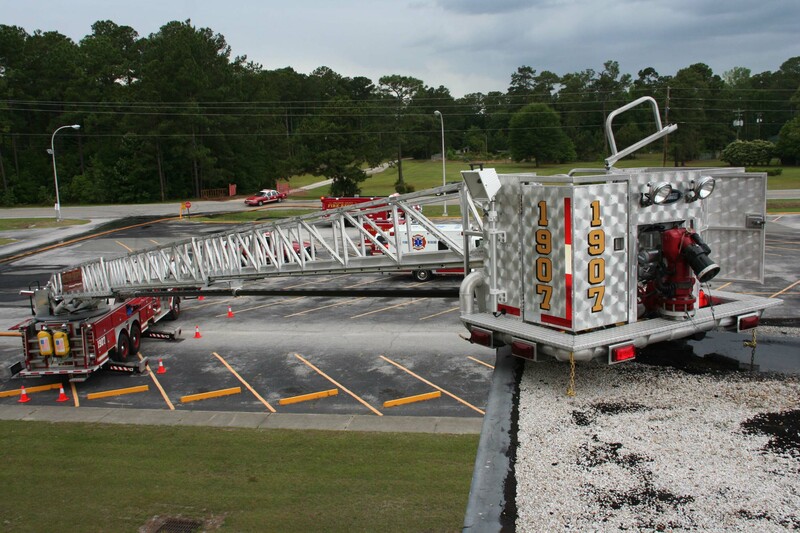 The South Carolina Fire Academy Course Catalog for July to December 2010 has been published. Click here to view the entire catalog on the SCFA website. 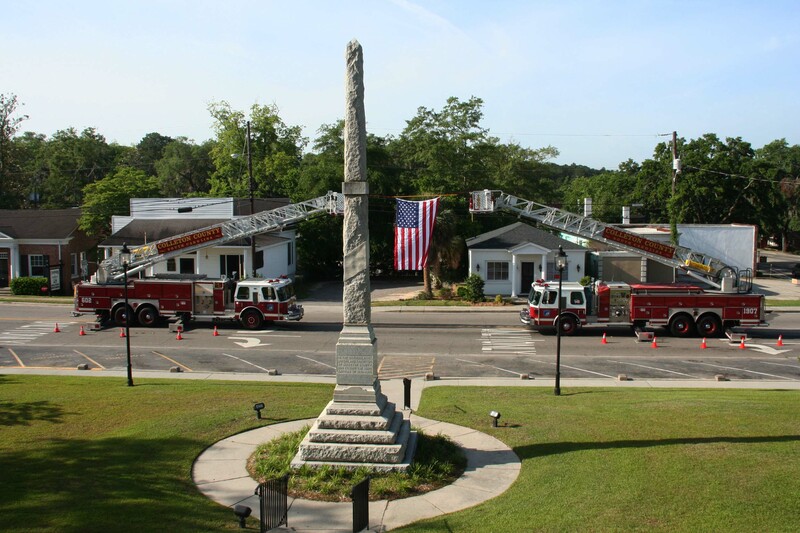 Click here to view a list of the courses that will be hosted by Colleton County Fire-Rescue. Stations 1, 19 and 26 responded to a structure fire at the Dayco Plant located at 938 Thunderbolt Drive at 1037, Tuesday morning 11-May. Engine 19 arrived two minutes later to report heavy smoke conditions in the four story dust collection building attached to the 120,000 square foot rubber products manufacturing facility. Click here for additional information. 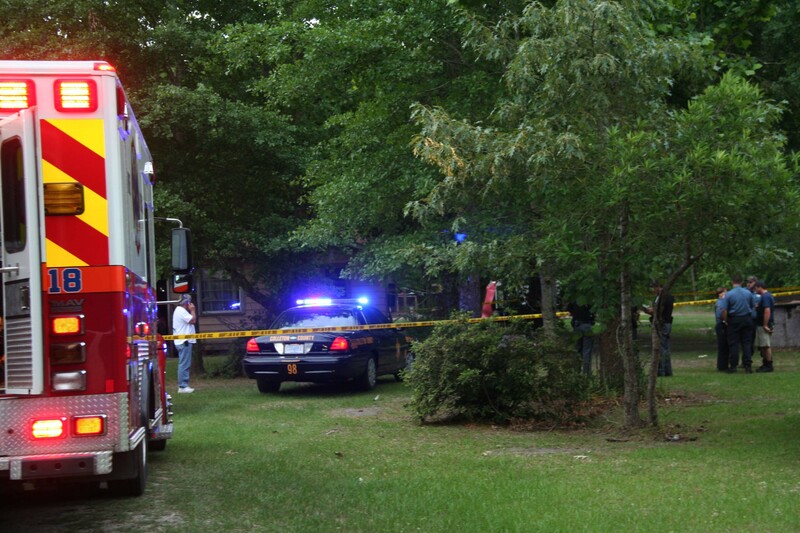 Stations 18 and 23 responded to a shooting incident at 4471 Cayce Road near the Ashton Community at 1855, Monday evening 10-May. Medic 18 arrived along with Sheriff’s Deputies to find a male patient lying face down in the yard. After examination, he was found to have received multiple gunshot wounds and had no signs of life. Click here for additional information. 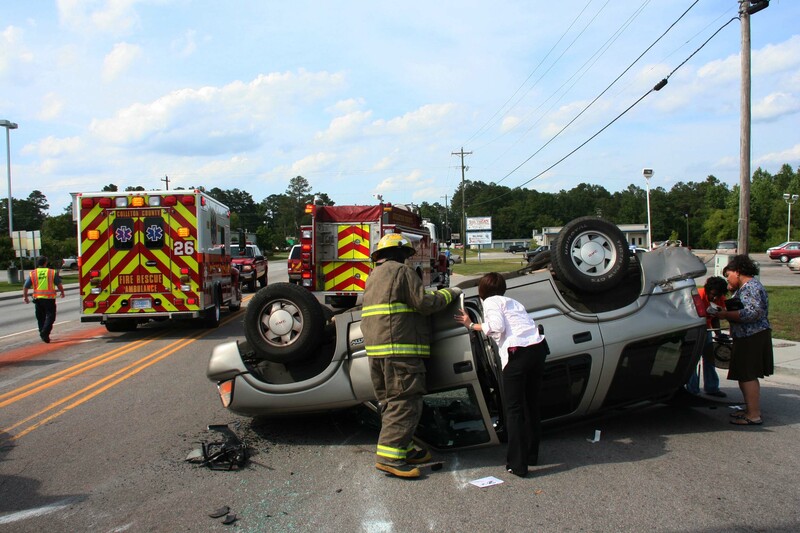 Stations 6 and 19 responded to a second fatal accident within 10 hours involving a person not wearing a seatbelt. 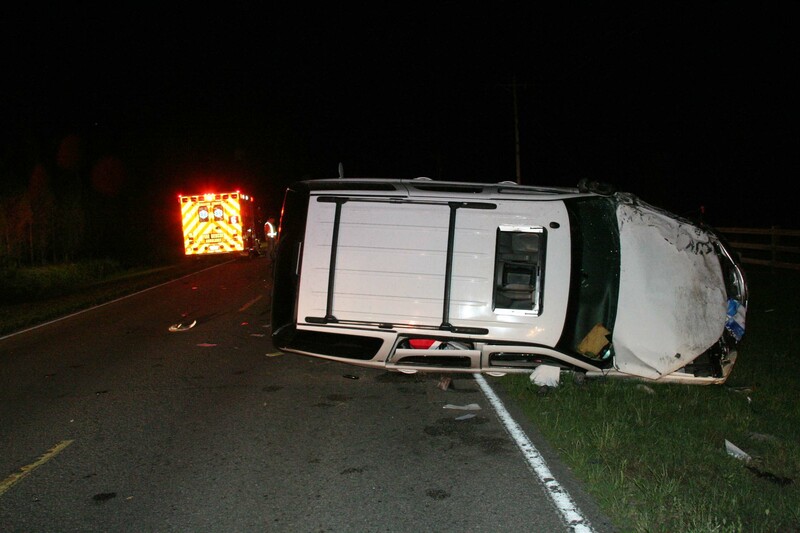 This accident occurred in the 4400 block of Charleston Hwy (SC Hwy 64) approximately 3-1/2 miles east of Walterboro, near the Mashawville Community. The incident was reported at 11:47 PM, Saturday evening 8-May. Click here for additional information. 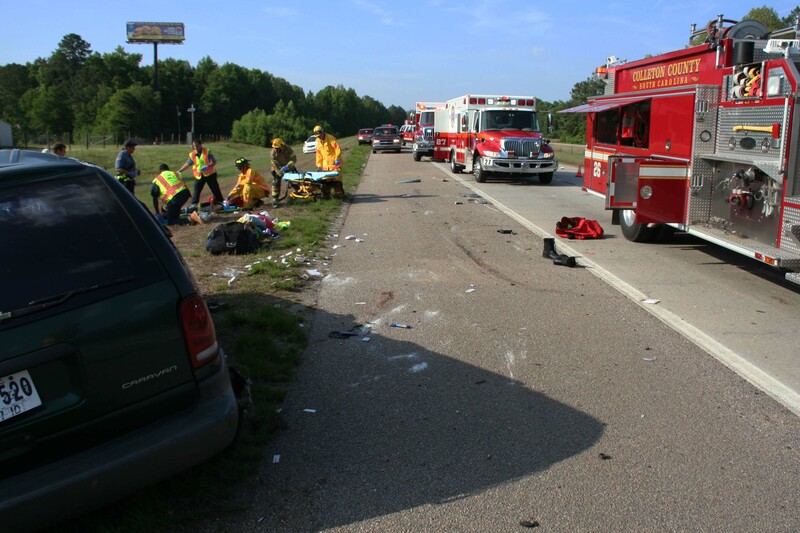 Stations 1, 18, 26 and 27 responded to a fatal single car MVC on I-95 at the 56 mile marker southbound at 1729, Saturday afternoon 8-May. A southbound 1997 Dodge mini-van suffered a possible tire failure causing the driver to lose control and enter the median. According to witnesses, the van flipped over four times, crossed both lanes of the highway before coming to rest backwards on the right hand shoulder. Click here for more information. 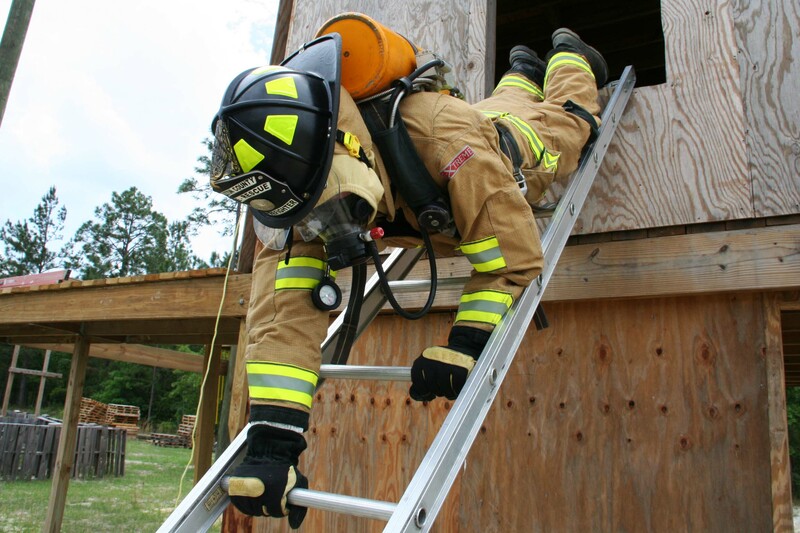 On May 3rd through 5th, 2010, Fire-Rescue personnel participated in rapid intervention training at Station 19. The training was taught by Captain Scott Feather, Battalion Chief Marty Stallings and personnel from Saint Andrews Fire Department. The course consists of classroom instruction as well as intense hands on evolutions. Personnel are taught how to free themselves from a variety of hazards. Click here for additional information. Stations 1 and 6 responded to a single car MVC on Green Pond Highway just south of Saxby Hill Road at 1908, Friday afternoon 7-May. The vehicle left the roadway at a high rate of speed and impacted the embankment, before landing on its side in the deep ditch. Evidence at the scene indicated the car struck the embankment at least twice and spun around before coming to rest. Click here for additional information. 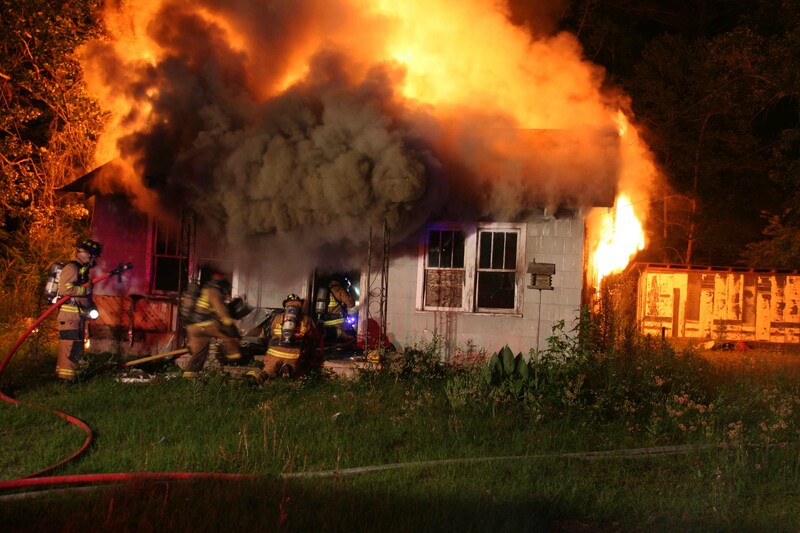 Stations 5, 7, 17, 18 and 26 responded to a structure fire at 6719 Sunrise Road at 0640, Friday morning 7-May. 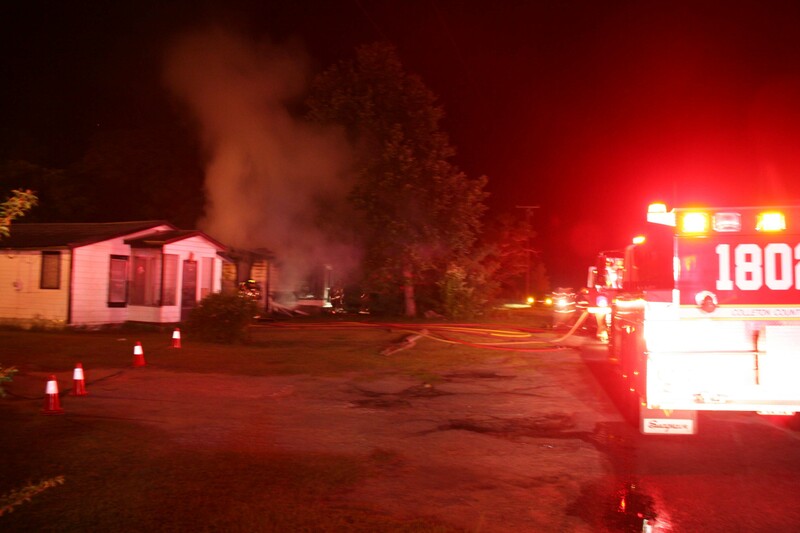 Initial calls to 9-1-1 reported the home was well involved. Engine 7 arrived approximately 10 minutes later to find the older singlewide mobile home 50% involved with the roof collapsed on the “C” side of the structure. The occupants including two infants escaped unharmed. Click here for additional information. Stations 5, 19, 24 and 26 responded to a structure fire at 106 Keegan Drive at 1024, Wednesday 5-May. 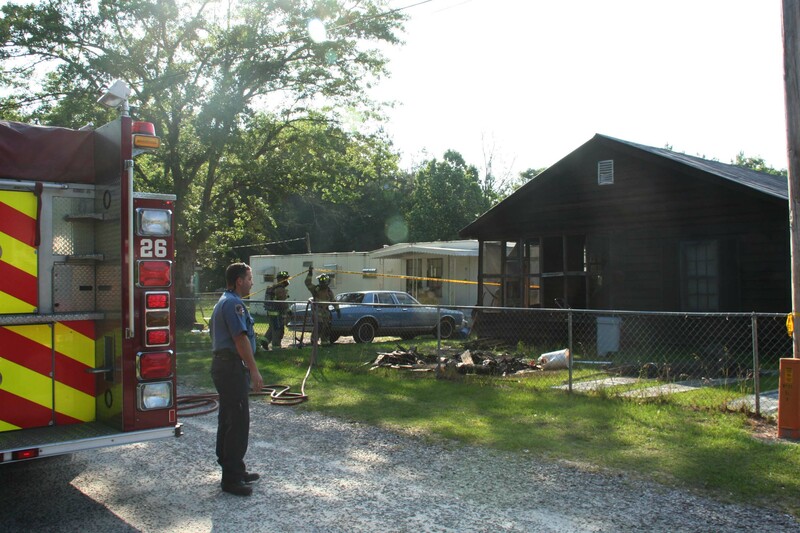 Ladder 19 and Medic 19 were the first to arrive and reported moderate smoke showing from a singlewide mobile home. Dispatch reports indicated the possibility of entrapment; however, a quick primary search revealed that all occupants were out of the building. Ladder 19 laid a 1.75" handline... click here for additional information. Congratulations to Station 15 Lieutenant Rodney Murdaugh and wife Brandi on the birth of their baby boy, Austin Paul, weighing 8 lb 2 oz and 20'' long. Lil Piggies Restaurant (10716 Cottageville Hwy, Cottageville) is holding a memorial fundraiser bar-b-que for Pearl Barr, a 13 year old who recently died of cancer. The fundraiser will be held on Saturday, May 15, 2010 from 12:00 to 20:00. Adult plates are $8.00 and children under 12 are $4.00.